The game likely won't be over before Metro service stops, and parking passes near the stadium are sold out. The Nationals will take on the Los Angeles Dodgers in a must-win game five of the National League Division Series Thursday. But with the game scheduled to begin at 8:08 p.m., it likely won't be over before Metro service ends -- and there are no plans to keep trains running later. The last train to Greenbelt will leave the Navy Yard station at 11:39 p.m., according to the Navy Yard station page. If you need to transfer to other lines, you will be able to make the connection, a Metro spokesperson said. The last train toward Branch Avenue will run at 12:17 a.m. Friday. According to the Nationals' postseason ticketing website, there are no parking passes still available for Thursday's game. ParkingPanda.com also shows that lots near the ballpark are sold out for the night. Passes are available for purchase on StubHub, but as of 2 p.m. on Thursday, the cheapest one will cost you $199. Watertaxi rides from the ballpark to Alexandria, Virginia, and Gaylord National Harbor in Maryland are also booked, according to the Potomac Riverboat Company website. 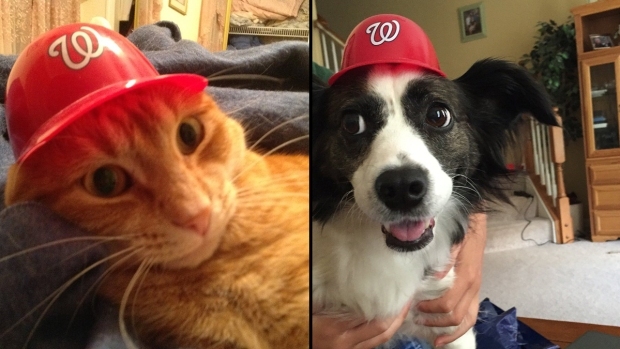 So if you'll be cheering on the Nats Thursday night, you'll have to plan ahead. Read on for ways you can get home with the Metro closed and parking impossible to get. The D.C. Circulator's Union Station-Navy Yard line is extending service to run until 1 a.m. Friday after Game 5. 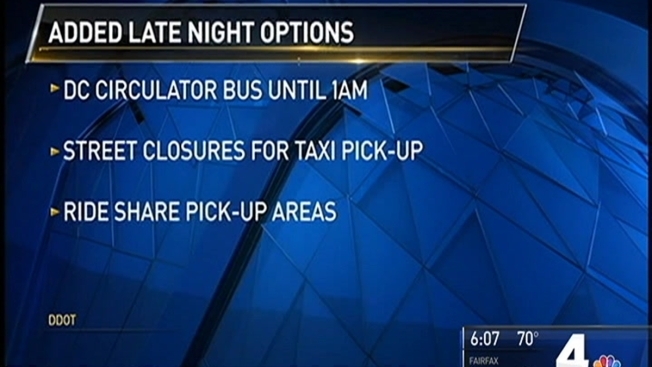 Fans can catch the bus at the Navy Yard Metro station, and the route provides for transfer to several Metrobus lines (although check when your last Metrobus line of the night runs -- this may not be an option for you Thursday night). Buses will run every 10 minutes, and rides only cost $1. If you take the Circulator, you can park at Union Station's 24-hour garage. Parking for two to 12 hours costs $20, and a valet service is also available. The line runs along H Street NE and past Eastern Market before arriving at Union Station; see the route map here. There are more than 250 bike racks available around Nationals Park, so if you're a cyclist, riding to the game might be a better option than driving (assuming you don't live too far out). The park also offers a free bike valet in Garage C the corner of N and 1st streets SE. The valet opens two hours before gametime and closes one hour after the last out. There are also four Capital Bikeshare docks located within a 10 minute walk of the ballpark. The CarpoolNow app allows riders in the D.C. area to coordinate carpools for free. The app, launched by the Metropolitan Washington Council of Governments last month, connects users offering a ride with those seeking a ride in real time, and also displays routes, estimates pickup times and confirms locations. Search "CarpoolNow" in the Apple or Google app stores to download. Nats fans have also taken to Twitter, using the hashtag #NatsRide to find others with whom to ride. Uber and Lyft also offer the option to schedule a ride in advance. But be prepared: Both charge increased surge prices when demand is high. Fans can catch a cab at a taxicab stand location on the north side of M Street SE between South Capitol Street and Half Street. The stand will remain open until 30 minutes after the game ends. But with the game sold out, fans might face long wait times to catch a ride. A (possibly) better option, if you're planning to use a taxi, would be to ride the Circulator to Union Station and catch a cab from there, where the crowds won't be as intense. Just hear us out. If you're a suburb dweller stressing about getting out of the city after the game... do you absolutely have to head home that night? Consider packing a bag and crashing on a friend's couch (with advance notice, of course). With parking passes going for at least $200, you might be better off booking a room for the night. You can search online for open rooms in the Navy Yard or Southwest Waterfront neighborhoods. If you live anywhere near the ballpark, you might consider just walking home. Or check which Metrobus lines run late night routes, and walk to the nearest stop. Walking would save you the cab fare and traffic nightmares you might otherwise face heading home. For reference, it's about a 40-minute walk from Nats Park to Union Station. But if you're going to trek across the District, stick to well-lit streets and travel in a group. If you've got a friend with a car and nothing to do Thursday night, ask them to pick you up. Offer to pay for their gas, and throw them some cash or get them a gift in exchange for dealing with the crowds and traffic. You'll definitely owe them a favor, but it might be worth it with your other options limited. The Nationals' official website states that "guests are encouraged to utilize various modes of transportation to travel to Nationals Park." "Inline skating to Nationals Park can be a convenient, healthy alternative," the website reads. Fans must remove their skates before entering the ballpark, but can store them under their seats until it's time to head home. But don't opt for a hoverboard: They're prohibited from the stadium.